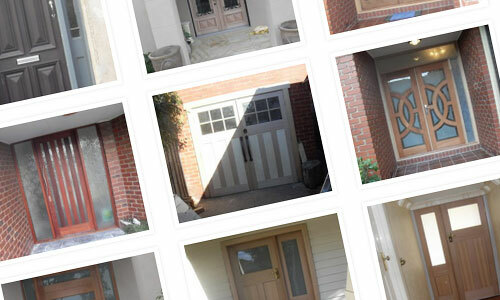 Specialising in timber door replacements in Melbourne’s Bayside and surrounding suburbs. Following are some testimonials from our happy customers. We contracted Steve to do some work at our house replacing our front entry frame early in 2016. He came out initially to meet with us and go through our options. We made our decision and then waited with anticipation the 4 weeks for it to be manufactured. Installation day came and Steve and his team turned up on time, with the materials arriving just after them. The old frame was removed and the new one installed. It looked amazing! We couldn’t be happier with the work completed or the attitude of the people completing the work. Well done to Steve and the team. Thankyou again. Steve and his assistant Nathan installed a pair of exterior French doors at our Hawthorn house in May 2013. It was a tricky job because the whole doorframe was out of whack due to movement in the house. They kept at it until they got it right. They arrived on time (for the quote and the job), did great work, honoured the quote price and were cheerful and efficient on site. I'd recommend their work and would use their services again if needed. At our request, the bi-fold door manufacturer provided us with a highly positive recommendation of the skilled talents provided by Hi-Tech. Steve proved to be not only affable, but extremely capable in the installation and set-up of the upstairs bi-fold doors. His attention to detail, as well as his suggestions to ensure the best outcome, were most appreciated. Without waxing too lyrical, Steve’s talents in fitting and crafting bi-fold doors were that of a ‘Michelangelo’. We used Hi-Tech services to fit our new front doors. Steve was extremely professional from start to finish and his work was of high quality. We highly recommend his services. Take a look at some pictures of work we have done or doors available that we can do, this may give you some ideas of options that we could incorporate into your home.